The Lily Pad Lounge - one of Second Life's oldest live music venues - is closing and Clyde, the sim on which it resides is up for sale. A post from Your2ndPlace indicates that after seven years, founder and owner Drift Monde has decided to close the pond to new swimmers. 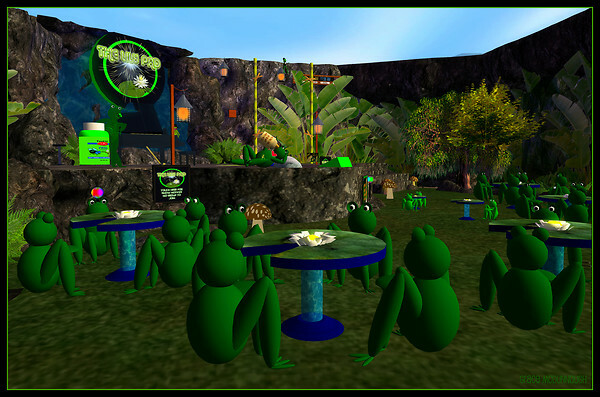 The Lily Pad Lounge has been a long standing live music icon in Second Life; many new artists got their start in the underground amphi-theater with Drift Monde patiently helping them learn the ropes. Drift joined Second Life in November of 2003 and while her time in world has been declining, there is no denying the many hours she has dedicated to the emergent live music community. Drift and Cua Curie hosted the very first "dual streaming" event with Astrin Few (Sam Hokin) and Flaming Moe (Brian Tervo) in February 2005. Sam (in Wisconsin) sent his guitar/vocal stream to Brian (in Miami), who mixed in his sax, and sent the resulting composite stream out to listeners in Second Life, on the Clyde sim. There is a YouTube video of the event and unfortunately Sam has disabled embedding but you can find it here. Always sad to have such an iconic place pass by the wayside. I have listened to many fine performers and spent times with good friends there. Hate to see it go!